Diane is a free spirit and true artist. She is a quiet force with an exquisite design sense. She always gives her best and will let her inner hippie side come out if you give her a chance. She has been sharing her talents at Kennedy's for 3 years. Kate joined our design team in 2015. She was the MSFA Young Designer of the Year in 2014. She loves flowers and creativity and it shows in her style as she continues to grow her talent. It's a jolly holiday with Mary because her zen-like calmness sets the tone in the design room. Mary has been a designer for over 30 years, and has been sharing her talents at Kennedy's since 2011. When asked, she's always willing to mentor her artistic style with her design team friends. Mandy just makes us smile. 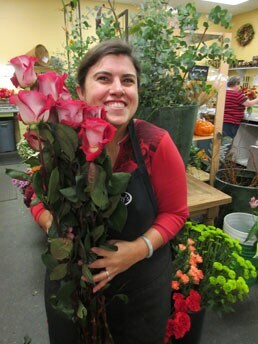 She's serious about her passion for flowers, and a prankster any chance she gets. Watch out! You may see rubber bugs or fake dung, and she loves to hear us gasp or see us jump. 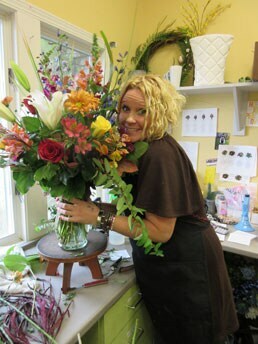 Mandy started designing in 1990 and has been sharing her talents at Kennedy's for 7 years. 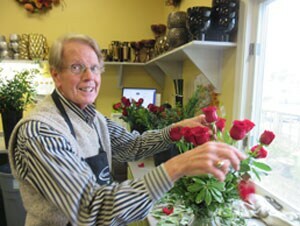 Wayne started his illustrious floral career 56 years ago with our founder, Gordon Kennedy. He had his own shop for many years. After selling and trying to retire full time, he came back and has been designing at Kennedy's for 14 years. Wayne has a fan club that come on Friday because that's the day he always works.